Amsterdam – April 23, 2014: Today BoosterMedia introduces League11, a new football management game fully based on HTML5. The goal of the game is to build and manage your team to success in an international league of friends and other users. League11 features photographs of over 2000 professional football players from all major competitions worldwide. 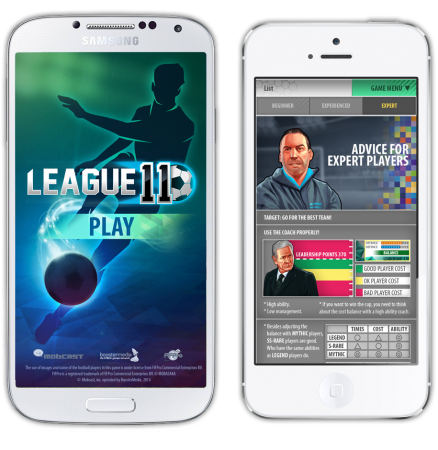 League11 will be first launched in the United Kingdom, followed by France, Germany and several other European and international markets. The game is based on Mobasaka, the original hit-title from Mobcast (Tokyo, Japan) that was previously released in Japan and Korea. In close partnership with Mobcast, BoosterMedia has fully adjusted the game for the Western markets. It can be accessed directly with any mobile browser via www.League11.com and will be distributed via BoosterMedia’s partner network of HTML5 games channels.